In a tradition that stretches back to 1878, the White House has opened its lawn to more than 35,000 people as part of the annual White House Easter Egg Roll on Monday. The event was briefly interrupted by a flying, buzzing harbinger of spring. Squeals and shrieks from a clump of agitated children interrupted President Obama's reading of his childhood favorite, Maurice Sendak's "Where the Wild Things Are," at the storytime stage, one of several outdoor stations at an event that has grown into far more than colored eggs. Obama looked up to see what the trouble was. "Oh no, it's a bee!" he said, laughing, then quickly tried to reassure the kids. "That's OK guys, bees are good. They won't land on you. They won't sting you." In fact, helping honeybees and other beleaguered pollinators survive is a goal of Obama's administration. Elsewhere at the event, children were given donated Burpee garden seeds to encourage them to plant bee-friendly habitats. But the kids ducking and dodging in their hay-bale seats had no interest in being part of this bee's habitat. "Scary!" one of them shouted. Obama — who had just led the children through imitations of the roaring, teeth-gnashing and eye-rolling of the storybook's monsters, finally got them settled down after a reminder that, "You're not supposed to be scared of bees when you're Wild Things." Officials said more than 35,000 people took part in the 137th egg roll, an event that began when President Rutherford B. Hayes opened the White House grounds to local children for egg rolling in 1878. Toddler boys in straw fedoras and little girls in spring dresses with bright sashes romped on the lawn. One girl, in pants, turned cartwheels while waiting her turn to roll a wooden egg. 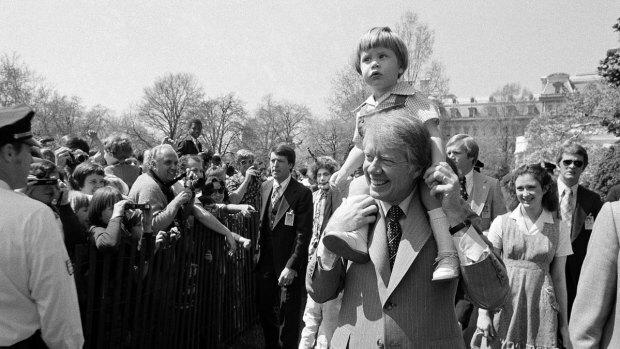 Eleven-year-old Madison Knight, decked out in sequined rabbit ears, said she'd never heard of egg rolling before — only egg hunting — but was game to try the White House tradition. Madison and her 9-year-old friend Kyla Newkirk, both from Durham, North Carolina, agreed that wasn't the most exciting part of the day, however. Their anticipated highlight? "Seeing the president!" Madison said, as she waited for Obama, first lady Michelle Obama and a giant Easter Bunny to emerge on the South Portico to officially start the day. The egg roll tradition involves children lining up to use wooden spoons to push the brightly painted eggs a short distance across the grass, in a loosely defined race to the finish line. It's harder than it sounds — especially for toddlers — and strategies range from nudging, poking and sideswiping the eggs to a scooping motion that sometimes sends them flying in unexpected directions. The Obamas stopped by to give encouragement. 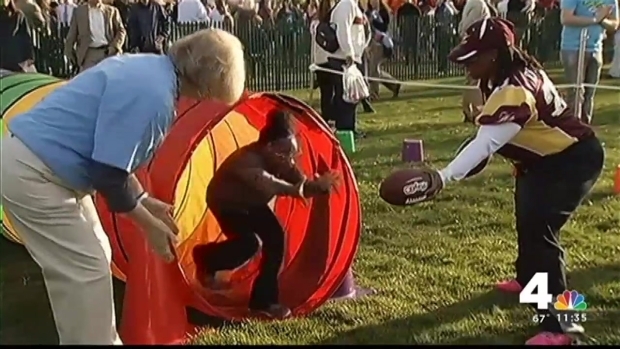 Michelle Obama leaned over to gently help one youngster get his egg moving again in mid-race. Obama offered high-fives, handshakes and hugs to kids and their parents. "Good job, guys," he said. The Obamas used the event to tout the fifth anniversary of the first lady's campaign to get kids to eat well and exercise. The girl group Fifth Harmony appeared with a not-so-healthy-looking cake to sing "Happy Birthday" to the "Let's Move!" effort. This year, the #GimmeFive theme was added, encouraging children to come up with five ways live healthier lives and to share them on social media. Making his rounds, Obama joined kids shooting baskets with Washington Wizards players and other athletes, missing his first shot but sinking the second. Then he took on tennis star Caroline Wozniacki in a doubles game with kids on a mini-court. Obama whooped when he scored against the Danish pro. "Got to work on those volleys," he teased, adding, "I'm a competitor." Then she served, and the president missed the return.